Jeremy Burke, owner and operator of the local independent bookstore Bay Books sees his job as putting smiles on faces and talking to everyone. Kay Gough, founder of Bay Books, put the store up for sale in 2011 when her husband's work took them out of the country. There was the potential the business would close. “When my wife and I bought this place, we couldn’t see Bay St. Louis without a bookstore,” said Burke. The way Burke sees it, people from all different walks of life and political views can find books that suit them in his shop. “We’re a bit of a think tank,” he said. Bay Books is certainly a wonderland of new and used books with a large selection of goodies children. The shop also specializes in local authors and has a great selection of cookbooks. If there's something a customer doesn't see on the shelves, Burke is always happy to order it. Saturday is the busiest day of the week for Bay Books. “Everyone loves to shop on a beautiful Saturday afternoon,” said Burke. Second Saturdays are especially popular as Burke often hosts book signings during the busy season. Bay Books is open Monday through Saturday, 10:30 a.m. to 5 p.m. except for Second Saturday, of course, when Main Street shops are open well into the evening. 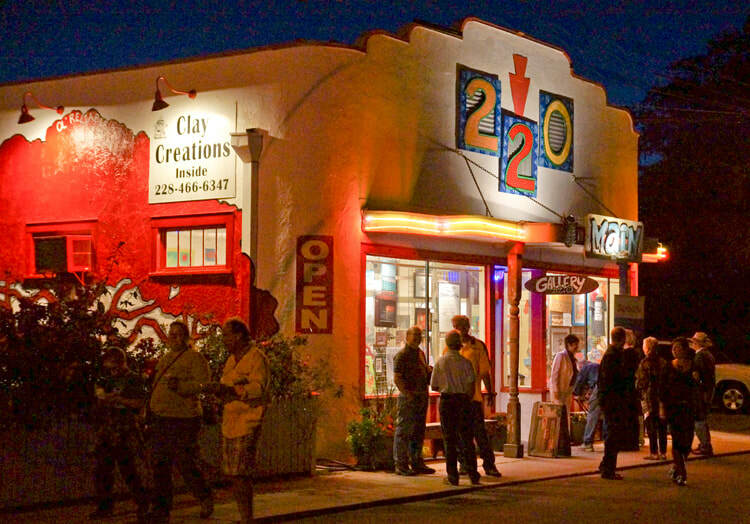 As visitors and locals drive down Main Street into the heart of Old Town, it’s hard to miss Gallery 220. The vibrant Coca-Cola mural on the side of 220 Main literally welcomes visitors to Old Town Bay St. Louis. Inside the Art Deco building, art lovers discover the work of 25 local makers, and at least one of the artists will be in the gallery greeting guests. Gallery 220 is a true co-operative where the artists work in the shop at least one day a month. Gallery 220 features a wide variety of artwork including painting, sculpture, jewelry, mosaics, textiles, pottery, photography and more. Truly there’s something for every interest, every age and every budget at this eclectic gallery. Jenise McCardell and Mark Currier acquired the building just before Katrina from local artist Vicki Niolet, who had a wide network of artists. “All of the artists of Bay St. Louis were suddenly adrift and needed a home base, so that’s why we opened as a co-op,” said McCardell. Before Katrina, shoppers will remember McCardell’s “Funky Rose” dress shop. Currier and she also opened their Clay Creations studio and shop in the back, where it remains today. The gallery’s artists also often host workshops to teach people tricks of their trades. Every inch of the gallery oozes art. In addition to the iconic Coca-Cola mural on the north side of the building, there’s also a mural of a tree on the beach side of the gallery that faces California Drawstrings and the other shops and restaurants of the 200 block. “We hosted a contest with the local school – the winning design was by a team of 4th graders who proposed a huge tree called Old Faithful,” said McCardell. McCardell loves surrounding herself with art and creativity. She used to live in the French Quarter. When her daughter Devon turned three years old, she found the Bay as an alternative to the creativity New Orleans offered, but with a small town feel.